The majestic station stood still in the calmness of the rainy morning. Nothing changed, except for the full parking lot and hell a lot of people. Quite an impressive view for me actually, since never in my personal experience as a trainspotter for almost three and a half years now that I had seen this many people at Ipoh station. Ipoh station used to be a dead station for many years now, until KTMB launched its new Ipoh-KL shuttle service quite some time in the past weeks. 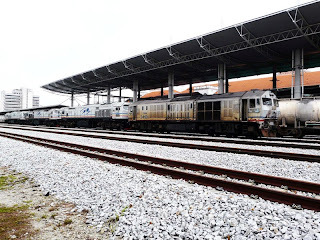 Instead of being a dead station, the glory days of Ipoh station came back to cheerish its memorable existence as once the largest, the busiest and the most majestic station in the far wide of Malayan railway service, serving the North Mainline. 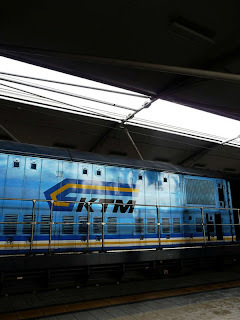 I was at the station for the gathering of KTM Railwayfan Club for the last time this current year 2008. 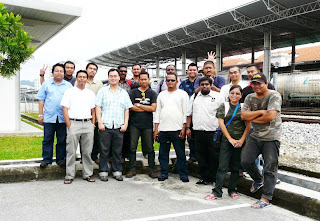 There were not many of us from Ipoh actually, only the three of us representating the station. Quiet rainy morning. Three 26-class Blue Tigers, two 29-class Dalians and one 24-class having their break. 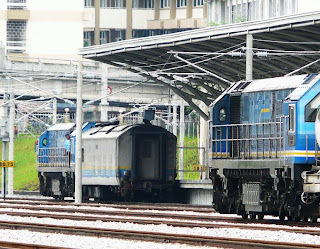 Shunting and coupling work of Power Generation Car (PGC) by a 29-class for Ekspress Senandung Malam, bound for Singapore at 1805 hour. 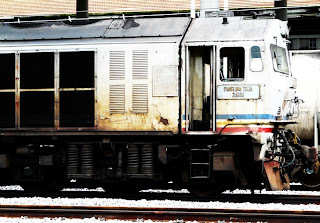 Old man 24-class engine 24101 Panglima Teja. Currently residing in Ipoh due to a major breakdown. 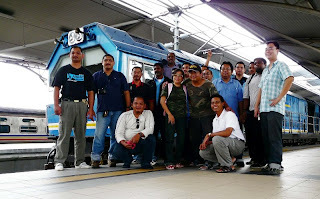 I started my trainspotting assignment in Ipoh since mid 2005, and I joined the KTM Railwayfan club since last year. Since the date, my knowledge expanded enthusiastically to becoming from rookie to intermediate, being able to tell the story of the rail, something that people don't even bother to listen to these days . In 2005, I was always alone at the station. It's so lonely, you know? Nobody got into the idea of liking these machines, and it went on until end of 2007, where I got to know about the club. Since then, I was never alone anymore. Crowd gathered along the platform following an announcement on arriving train from Kuala Lumpur. It's a Blue Tiger pulling 4 coaches and one PGC, slowing down as it pushed against the wind and stopped right in front of the majectic building walls. 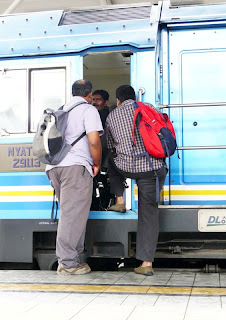 Apparently, everyone was all curious about not only the train service but the train itself. A large number of people spooled at one spot of the platform to witness how decoupling and coupling works were done, and from their talks and observations, there were such admiration shown towards these long forgotten diesel locomotives. Suddenly, the locomotive became 'the thing'. 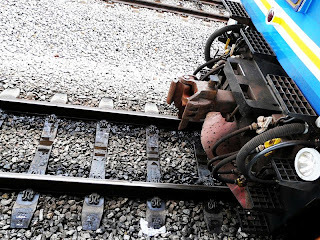 The locomotive decoupled from the passenger consist. 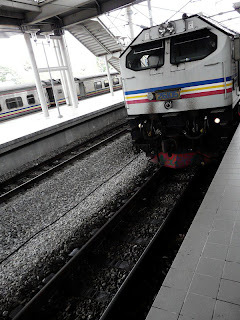 Took a u-turn and coupled itself back to the consist, now ready bound for KL. Look at the crowd. This train brought along the club members. So many of them that I could not tell who is who. 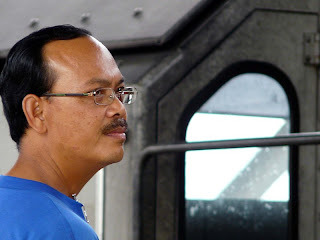 As the local trainspotter, I and two other Ipoh trainspotters brought them around for spotting activities, and then took a picture of ourselves having locomotives and the station as the background. A friend brought along his wife, who is also a trainspotter, who knows hell a lot more than I do. What a couple, sharing the same hobby together. Could be one in a million of them ladies in Malaysia I guess. So we went around for food, sightseeing, and finally a meeting that discussed the club activities so far and changes to see in 2009. So far the club is growing rapidly, and since the shuttle service is already up and running, there are possibilities that the membership count will peak. The Engineer - Ipoh train engineer who inspects all incoming trains for damages. Treats them like his own babies. When they left, we waived goodbye to each other and took our each way home. 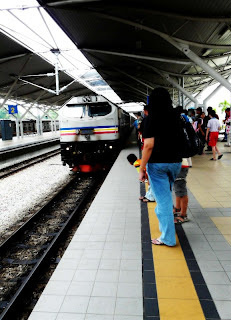 I was heading for Tronoh while the other two Ipoh trainspotters were heading for Lahat. As I left the station, there were still a lot of people and the station was still busy, almost KL Sentral equivalent but at a smaller scale. And for once, I felt happy. Ipoh station is alive again. For all these while, the effort to come alone to the station to spot was worth it. I was so going to miss my time I spent at the station, and I will miss the station too. It was not easy these days to come here since my commitment grew like mushrooms on other things. 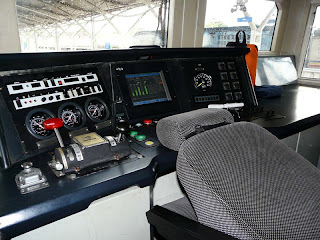 I walked in the rain to my car and before I sat on the driving seat, I took a look at the station once again. It looked happy, too. As if it was trying to say something, something that I myself too wanted to let the station know. 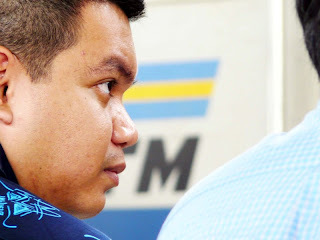 jrg yang pamerkan pic sebegini..
oh time kaseh..amik gamba suke2 je..